When Emily Damore ’19 of Abington, Massachusetts decided to volunteer at the Life Care Centers of America’s (LCCA) Soundtrack of Life program, she knew it would be a good experience for her resume. What she didn’t realize is that it would change her appreciation for music and her outlook on life. 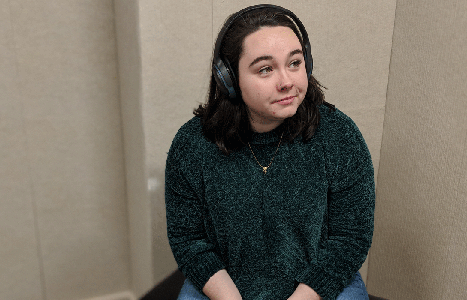 Damore is a music and interdisciplinary studies double major. She plans to become a licensed music therapist and, in fact, has already started using music to heal. 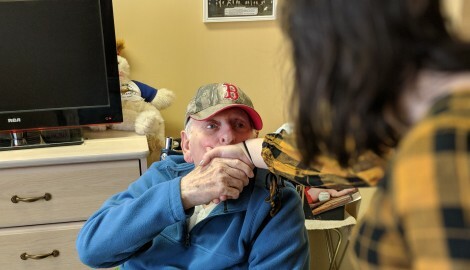 She is one of 16 Stonehill College students who volunteer their time to Soundtrack of Life, a habilitation program for patients with Alzheimer’s Disease and dementia at LCCA’s West Bridgewater campus. 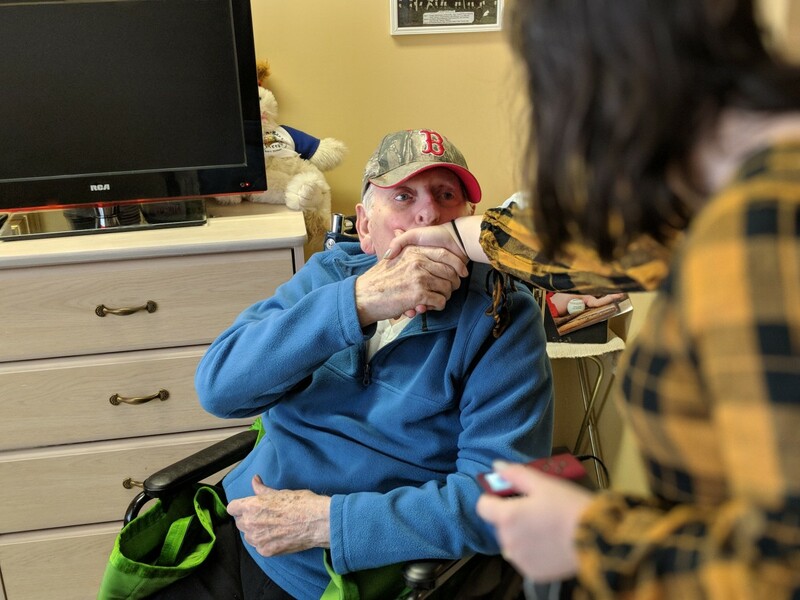 Students receive four hours of training from the medical staff on how to work with patients with diseases like Alzheimer’s and dementia, which destroy memory and other mental functions. Associate professor of music Lisa Redpath forged the partnership between Stonehill and LCCA over a year ago. Music helped her mother have moments of clarity before she died from dementia. As volunteers, students work with patients, staff and their families to create custom playlists for each patient. Padded headphones are placed over their ears, eliminating distractions. They listen to the music for 30 minutes to an hour, and students record any behavioral changes in a binder after the session. The music can have such an impact on the patient, it changes their mood or moves them to communicate, even if they’ve lost that ability. You do not have to be a musician to volunteer with Soundtrack of Life. Students can contribute as much time as their schedule allows. 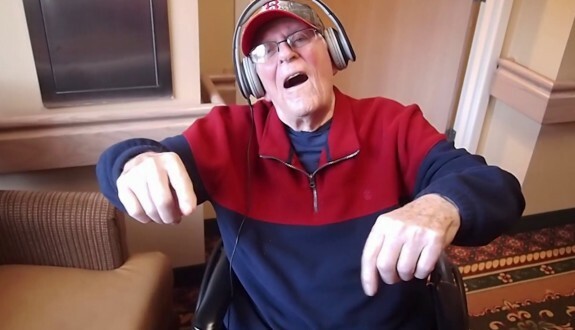 Damore spends at least one hour each week dancing with patients and connecting though music. The documentary Alive Inside, which won the Sundance Film Festival ‘Audience Award’ in 2014, tells the story of this national music therapy initiative using footage of patients who are habilitated through music. There is a copy available at the MacPhaidin Library. If you are interested in volunteering with Soundtrack of Life, contact Lisa Redpath at lredpath@stonehill.edu. Interested in attending Stonehill? Sign up now to be added to our mailing list. Visiting campus is the best way to experience what Stonehill is all about!